Tender Arts Studio: Let's flock together! You know, like "Birds of a Feather"! One of the swaps that I am most excited about right now is on The Faerie Zine. It is a collaborative book and the name of the swap is Birds of a Feather. Here's the idea: Sixteen artists will each create sixteen identical 5"x 5" book pages. Then, the artists will send their pages and $10 to Lisa Kettell, moderator of The Faerie Zine. She will collate the pages, create front and back covers and bind the books and then mail them to the collaborating artists. How cool is that? You know, when I do make money in my etsy shop, I usually spend the money on boring things like groceries. I rarely get to buy any of the wonderful things I see other artists offering. By participating in swaps, I am getting the opportunity to own original art by some of my favorite artists! Doesn't that sound great? Won't you join us? There is still room in the swap for four more people. 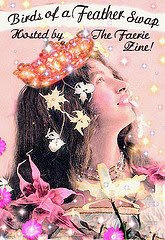 The Faerie Zine is a private group, but I will happily send you an invite. You can take a peek around and see if you might like to join the swap. Just indicate your interest in a comment and I will get back to you with an invitation. P.S. To get you started, here is a free image from the The Collage Pool. Nice, eh? Hi! I found your blog through Flickr. I just recently made you one of my contacts, (I'm Seaside Rose Garden). Your dolls are adorable! I saw that you live in Sacramento. I used to live in Sacramento before I moved to Texas and I really miss California and my family there. So nice to "meet" you!